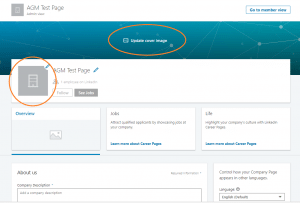 Having a LinkedIn Company Page gives you the ability to promote your products and services, recruit top talent, and share important information with your professional network. LinkedIn now has over 500 million users worldwide. Your business should set up a LinkedIn company page and begin to connect with potential partners, customers, and employees that you may be missing out on. Setting up a company page is very easy and is a great way to leverage social media to help meet your digital marketing goals. Prerequisite: In order to have a company page, you must first have a personal profile. If you don’t have a personal profile yet, this blog has instructions to help you set one up. 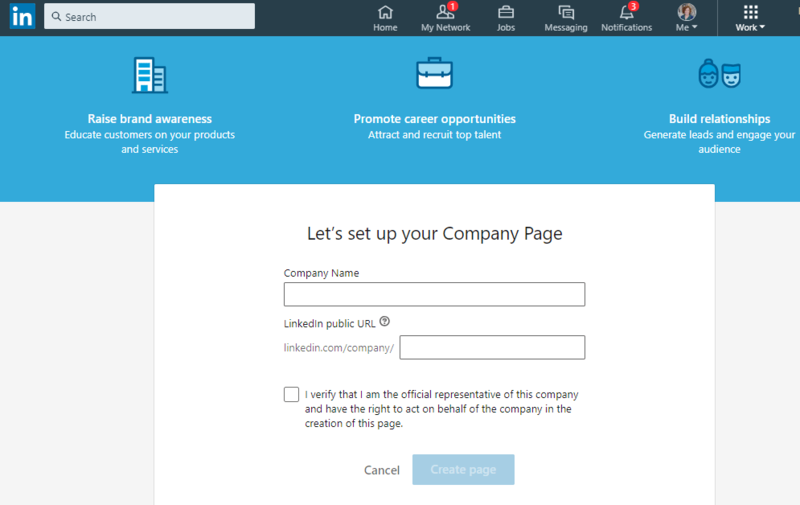 Create a Company Page: From your personal LinkedIn page, click the “Work” icon in the top right corner and select “Create a Company Page.” You will have to verify your email address. Once the email address is verified, you can start populating. Note: LinkedIn will not accept a email from gmail or yahoo etc. You will need to have an email that is yourname@yourcompany.com. Enter your company name and choose a URL. Then click “Create page” followed by “Get started.” Now you can begin to populate your new company page. Add a cover image and your logo. According to LinkedIn Market Solutions, companies with logo images get six times more visits to their company pages. Adding these images helps your page come to life and stand out in the crowd. The logo will also show up on your employees’ pages. Add a description of your company. What does your company do? What do you specialize in? What makes you unique? Remember to use your keywords and fill out descriptions of products/services fully. Grow your following. With the steps above completed, your company page is ready to begin working for you. 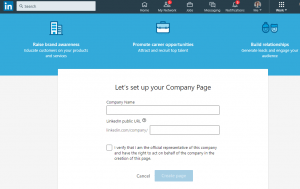 Leverage your employees and encourage them to add your company to their personal profiles. In doing so, they automatically become followers of your page. You can also share your LinkedIn page on other social media accounts to encourage followers, share your company page on your personal LinkedIn page, ask for followers, etc. Publish content. Posting regular updates is an important step in bringing life and value to your Company Page.. You can share company news, industry information, blogs you’ve written, and more. You can also boost this content to select audiences and expand your reach even further. Don’t forget to share your company’s posts on your personal accounts, too, and encourage contacts to follow your company page. Ask your employees to do the same. Promote your LinkedIn Company Page. Add a follow button to your email newsletters, website, blogs, or other marketing channels. You can also consider advertising on LinkedIn to achieve your marketing goals by targeting a specific audience. Quick Tip: Once your company profile is set up, go back to your personal profile and click “Edit” next to your current position. Retype your company name and it should populate a drop down box that you can choose your company from. This will put a direct link from your personal profile to your company profile. Pretty nifty. Voilà! Now you’re ready to promote your business on LinkedIn! 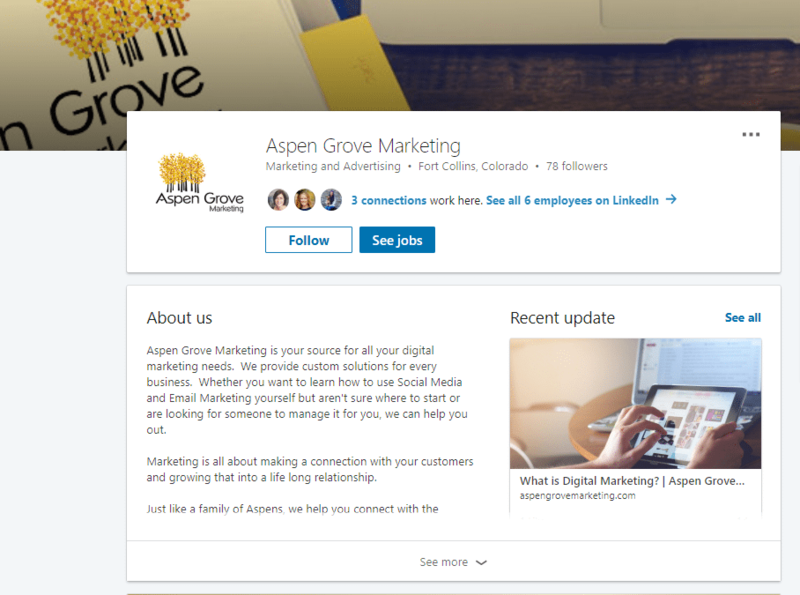 If you’re feeling overwhelmed by the thought of managing yet another social media platform for your business, consider a meeting with Aspen Grove Marketing to learn how we can help! We offer a full range of digital marketing services, from social media management to blog writing and newsletters. We also offer training sessions to show you the ropes and help you feel more confident and organized in your digital marketing abilities. Whatever you’re after, we’d love to help. Contact us to learn more.